"What happens when the only girl in the world who doesn't want to marry a Prince is the only one who has to?" "The House of Sever" is a light-hearted historical romance novel, following the journey of Rhema de Frees, a tomboy baroness living in fictional 19th century Gallia. Though Rhema would like nothing better than to remain happily obscure with her family and her childhood crush, Jonathan, circumstances beyond her control thrust her into the world of society, politics, revolution, and love. Most of all, she must untangle her feelings for the inscrutable Prince Bastion van Sever before time runs out. Told in three parts (The Virgin's Lullaby, The Wakeful Bride, and The Princess Incumbent), we follow Rhema not just into 'happily ever after' but beyond it into the consequences of adulthood. Guided by Rhema's lively imagination, humor, and unique way of looking at the world, The House of Sever is appropriate for both young adults and adults who are young at heart. 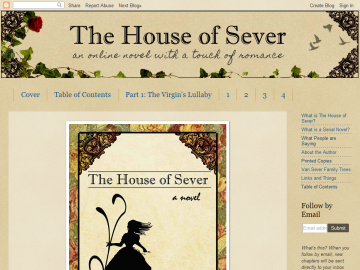 The House of Sever has not been reviewed yet. The House of Sever has not been recommended yet.